In the previous article, I’ve shared some experiences in Hadoop coding with the agile esProc syntax. In the previous article, I’ve shared some experiences in Hadoop coding with the agile esProc syntax. This article is the supplementary and in-depth discussion based on the previous one. Firstly, let’t talk about the Cellset Code. As can be seen, the computational result in A2 is reused in B2 and A3. Look good. The branch of judgment statement can be recognized well. The code block appears clear and neat without the deliberate edits. The code in A10 can be rewritten in two cells separately, one for sorting, and another for filtering. But in the actual given code, the “,” is used to consolidate the computations of these two steps – this mechanism is referred to as the Object Reference. Object Reference reduces the workload of coding and result in the more agile coding. The big data computation usually involves the access to Hive database or traditional database. MapReduce requires users to write the complex connect\statement\result statement, while esProc supports direct composing the SQL statement to saves users all these troubles. 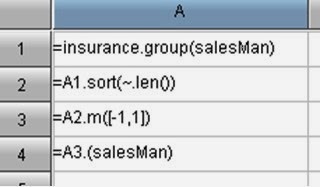 For example, to get the sales record from the the data source HData of a Hive database, esProc enables users to complete all work with one statement: $(HData)select * from sales. The function option is a nice design to make the function structure much simplier, and the coding more agile. In this case, the parameter can be classified into three levels, and the outermost level: The branch and the default branch is separated with “;”; The middle level: Each branch is separated with “,”; The innermost level: The judgment expressions and results in each branch are separated with “: “. This is a parameter combination of three-level tree structure. A1 cell: Group by sales person. Each group is a set of all policies of one sales person. A2 cell: Sort the group by the number of policies. In the code snippet, the “~” represents a group of policies corresponding to each sales person. A3 cell: Find the groups having the most or the least polices. They are the first group and the last group in cell A2. A4 cell: List the name of sales person. They are the sales persons corresponding to the two groups of policies in A3. The agile syntax of esProc boosts the efficiency of code development, and reduces the development workload dramatically.